Lennie James returns as Morgan on the season-six premiere of The Walking Dead tonight, and pretty much everyone is psyched to see what has happened to his character. But an equally pressing question is: How in the hell did this actor become such a badass at the art of stick fighting? At AMC’s Ultimate Fan Premiere of the new season, James told us that he’s been training with martial artist Steven Ho. Why is this cool? Ho played the fight double for the bo-wielding Donatello in the original Teenage Mutant Ninja Turtles movies. And it turns out that James is a quick study, “I don’t want to toot my own horn, but I took to it much faster than I thought I would. And, that made shooting the series a lot better. It meant that we could push along what we’d show in an episode at a higher level. 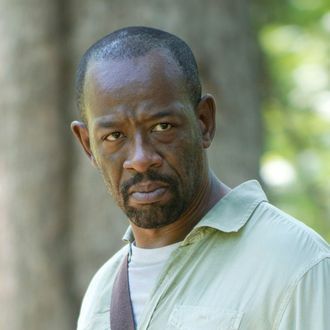 And I feel like the stick has become important to Morgan’s identity.” It sounds like Morgan will be bashing in a lot of walker brains this season, turtle style. Go ninja, go ninja, go?